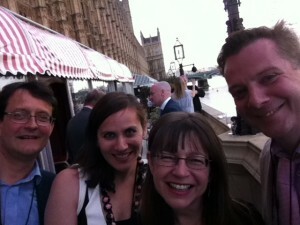 Members of the CEN attended the launch of Learnus at the House of Lords on 11 June 2014. Learnus is a lobby group, dedicated to bringing together teachers and those who specialise in the study of the brain, the mind and behaviour in order to bring the insights gained from the scientific study of learning to the practice of teaching. The CEN and Learnus have a strategic partnership aiming to advance dialogue and translation between neuroscience and education. From left to right, Prof. Denis Mareschal, Dr. Irois Dumontheil, Dr. Chloe Marshall, Prof. Michael Thomas. At the Learnus launch, Professor Dame Uta Frith, DBE, FRS, FBA gave a keynote speech where she compared the enterprise of linking neuroscience and education with the construction of the Channel Tunnel – long-term, involving many resources and thousands of people, but with the potential of a great and enduring benefit. See here for a text of her speech.